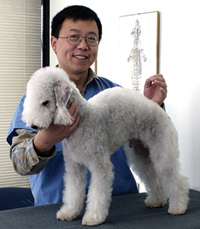 Dr. Qi graduated from the Beijing Veterinary College in 1984 and achieved his Masters degree in Veterinary Medicine in 1987. Dr. Qi worked for the Traditional Chinese Medicine Institute in China as a a researcher while studying Traditional Chinese Medicine for 5 years. Since 1992, Dr. Qi has lived in North America where he has practiced in primary care as well as Acupuncture and Chinese herbal medicines in small animal care clinics in New York, Toronto, and Winnipeg before finding a home in Calgary in 2001. Dr. Qi has practiced veterinary medicine for 23 years and is the co-owner and operator of the Calgary Holistic Veterinary Clinic. He loves what he does and enjoys going into work everyday. 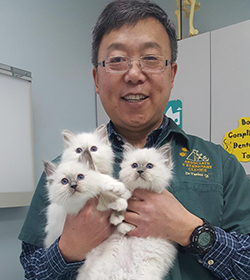 In addition to his love of veterinary medicine, Dr. Qi also has another love – his family. Married for 18 years, Dr. Qi has 2 children; Alex and Alvin as well as to a small Bicon Shitzu Cross named “Berry”. Dr. Qi has a very busy family, as both Alvin and Alex play soccer, so when he is not at the clinic, chances are you will see him on the sidelines cheering on his boys at their games. © 2019 Calgary Holistic Veterinary Clinic.